Hank (Paul Dano) is a man stranded on a deserted island, until he finds a corpse floating in the water. Hank names the corpse Manny. (Daniel Radcliffe) Hank discovers he can talk to Manny, and that Manny’s continued flatulence moves them from one side of the island to the other. The gas can even scare off bears. The more Hank talks to Manny, the more alive Manny becomes. When Hank starts talking to Manny about a girl named Sarah, (Mary Elizabeth Winstead) Manny really starts to perk up. The more Hank talks to Manny, the closer they become, but whose girlfriend is Sarah? And will the friendship that has developed between Hank and Manny disappear because of Sarah? Do Hank and Manny make it off the island? Swiss Army Man is a bizarre movie if taken literally, a man stranded on an island talking to a corpse and the corpse starts to talk back. But if taken as a metaphor about friendship or love it starts to make sense, Hank either loves himself enough to will himself out of his current circumstances or he loves Sarah enough to brighten his current circumstances. The movie is obviously about love, either love of a friend or love of a girl than may rescue a person from the direst of circumstances. I’d like to give the movie that much credit, but it is far too juvenile for long stretches to deserve that sort of credit. It’s overreliance on flatulence as a plot device, its incessant talk of masturbation, and erections make it seem like Swiss Army Men was written by a pair of teenagers. And of course there are gay overtones in the friendship between Manny and Hank, because men can’t just be friends right? The final nail in this movie’s coffin is the idiotic M. Knight Shyamalan nothing-is-as-it-appears to-be- ending. This movie took a good premise and wrecked it. The performances are good. Dano is good as a lonely guy on the verge of suicide, who just needs someone to love him. He conveys a sense of shy desperation well. Daniel Radcliffe is very good, despite being given some very awkward dialogue. He is the human Swiss Army knife a multi-use instrument used to survive a desperate situation. He is friend, rival, and love interest all rolled into one, and he has to do it with the constraints of acting like a corpse. This is also about as far away from Harry Potter as Radcliffe can get, so give him credit for taking risks. Mary Elizabeth Winstead is woefully underused in this film as Sarah, it’s a shame, because she has become one of my favorite new actresses. The direction is ok for a movie with such a small budget, there is a sense of whimsy in some of the sequences where Hank experiences love, but the island scenes are pretty pedestrian, and the pacing is pretty slow for such a short film, barely over 90 minutes. The performances are good, but I don’t know if the credit belongs to the actors or the director. Swiss Army Man: A sometimes cutting satire. Wallace (Daniel Radcliffe) has dropped out of medical school in Canada, and now writes technical manuals of some kind. Despite a bad breakup and general cynicism about love, Wallace’s roommate Allan (Adam Driver) introduces Wallace to his cousin, Chantry, (Zoe Kazan) but Chantry has a boyfriend, named Ben (Rafe Spall) who works as a negotiator for the U.N.so Wallace and Chantry agree to be friends. They run into each other outside a movie, and start trading e-mails about silly things like Fool’s Gold, a bacon and PB&J sandwich which was Evis’ favorite. Eventually, Chantry wants Wallace to meet Ben, chantry tries to introduce Wallace to her sister, Dalla (Megan Park) but the evening ends badly as Wallace accidentally pushes Ben out the window. At the emergency room Chantry meets Wallace’s ex, Megan. Chantry finds out that Ben gets a job in Ireland, and will be all over Europe for the next six months. Wallace and Chantry inevitably get closer, and Wallace is definitely in love with her, but afraid to tell her his true feelings because he’s afraid of losing her friendship. Does Wallace admit his true feeling for Chantry? I like this movie a lot. It’s extremely funny, the characters are interesting, with interesting jobs Chantry is an animator, Ben is a U.N. negotiator, yet they have detailed conversations about trivial things, like a sandwich called Fool’s Gold or the name of whipped cream. There are issues with the script. There was a totally unnecessary relationship with Allan and a girl named Nicole, which could have been edited. What if is also very conventional, the cynical guy falls for the first girl he meets, Chantry introduces Wallace to her sister, and the ending is predictable. But this was a happy, light movie so the ending fit. I’ve said it before, with romantic comedies, it’s not always the destination, but the journey, and this was a journey well worth taking. The acting is very good. Daniel Radcliffe, making a break from his sci fi/horror roles, is a pretty good comedic actor, after a somewhat bumpy start. Comedy requires a great deal of timing, and Radcliffe had some trouble with the timing at first, but caught on quickly, and did a nice job. Zoe Kazan is perfect in her role, she is funny, and sweet, and she plays an animator, although the viewer never sees her draw a thing, it seems like she could be an animator. She has a Zooey Deschanel quirky quality to her. But it is Adam Driver who absolutely steals this movie, he is funny, and outrageous, and has perfect timing. I can see why he is such a hit on Girls, which I’ve never seen. Unlike Star Wars, he really gets a chance to be funny here and is. Rafe Spall’s accent slips here and there, so I’m glad Radcliffe didn’t try to do an American accent. The direction is mostly good, the pacing is fine, a few of the subplots could have been edited down in the interest of time, but the story moved along quite well. There were some nice flourishes with the addition of animation to the film, but I don’t think the viewer ever saw the drawings credited to her. The director gets good performances from everyone, so even though he’s a little known Canadian director, he did a decent job with this movie. What If? No question, a good rom-com. Harry Potter (Daniel Radcliffe) is on the run from Lord Voldemort (Ralph Fiennes) who has sworn to kill him. While running for his life, Harry has been tasked by Professor Dumbledore (Michael Gambon) to try to destroy the seven horcrux’ or pieces of Voldemort’s soul. Harry, Ron Weasley )Rupert Grint) and Hermione Granger (Emma Watson) first think the horcrux is with Mondungus Fletcher (Andy Linden) a thief who betrayed Harry earlier, but they find it on a locket worn by Delores Umbridge (Imelda Staunton) who is now a bigwig in the suddenly evil ministry of magic. They take the horcrux from Umbridge, but try as they might, they can’t destroy the horcrux, for that they need the sword of Gryffindor, which Harry originally used to kill a basilisk, a large venomous snake, the venom will also kill the horcrux. Just wearing Voldemort’s horcrux is causing tensions to rise between Ron, Harry and Hermione. Ron finally leaves his friends in a jealous rage, he is convinced that Harry and Hermione are in love with each other . Harry finally finds the sword in the forest of Dean at the bottom of a frozen lake. He is almost drowned by the horcux and is saved by none other than Ron, who comes back retrieves the sword and kills the horcrux. Hermione is intrigued by the symbol that keeps turning up, on the book given to her by Dumbledore, on a chain worn by Xenophilius Lovegood (Rhys Ifans) and on Harry’s parents’ gravestones. Mr. Lovegood recounts the story of the three brothers, magicians who all wanted to cheat death. The symbol is the symbol of the deathly hallows. What is the symbol of the deathly hallows? And why does Vodemort want one of its elements so desperately? Harry is once again on the run, this time to find the elements that make up the deathly hallows before Voldemort. This is a very good film. This almost feels like an epic novel, like the Iliad or the Odyssey or the Quest for the Holy Grail, finally the youthful main characters seem all grown up and larger than life, fighting an epic battle of good versus evil. Daniel Radcliffe and Emma Watson are excellent in their ever more complex roles, only Rupert Grint seems whiny and unsure of himself. Ralph Fiennes is incredibly menacing as Voldemort, every good series like this needs a villain, and Fiennes is surely the embodiment of evil. I have thoroughly enjoyed the last two Harry Potter movies, perhaps because of the work of Fiennes, but also because I like the good versus evil theme when it’s done well, and I could tell by the end of the Half Blood Prince, that this would shape up as an epic story, and so far it has. Harry Potter and The Deathly Hallows: Give em hell Harry. Harry Potter(Radcliffe) is back for year number 6 at Hogwarts, but things are not as carefree as they’ve always been. Voldemort is very much alive and terrorizing London, and people at Hogwarts are very much taking sides. There is a plot afoot to kill professor Dumbledore (Michael Gambon) inspired by Waldemort and set in motion by Draco Malfoy (Tom Fenton). Professor Snape (Alan Rickman) has taken a secret oath to protect Draco, and to follow through with Dumbledore’s assassination if Draco doesn’t do it. Dumbledore hires a potions teacher, Horace Slughorn, (Jim Broadbent) who has taught at Hogwarts before, was hired because he taught a young Tom Riddle (Frank Dillane) the boy who turned into Voldemort. Slughorn has altered his own memory to hide a secret about Riddle/Voldemort? Can Dumbledore find the secret about Riddle? Does Malfoy or Snape follow through on their assassination attempt on Dumbledore? At its best this movie is engaging, imaginative and yes scary. Especially scary is Helena Bonham Carter as Beatrix Lestrange. She’s got a screw loose, and she enjoys killing people. Bonham Carter clearly revels at playing such a nasty role, and she’s good at it. Frank Dillane is creepy as the young Tom Riddle, so serious, yet so evil, nicely underplayed by Frank Dillane. But at its worst, this movie is a clunky, bloated at times silly movie. My advice to the makers of this movie is to cut out the romance, which plays like a bad Harlequin romance. There is no romantic continuity between the movies, first it seems like Harry is interested in Cho, then it’s hinted that something might happen between Harry and Luna, now it’s Harry and Ron’s sister Ginny. A romance has to be built up over time, I’m sure the books go into more detail, but the movies make it seem like Hurry’s interested in a different girl every year. And this movie creates a love triangle for Ron, and I really didn’t believe that Hermione gave a damn, because there is no chemistry between Grint and Watson. Also cut out the quidditch scenes, I think everyone’s outgrown those, especially those kids who’ve seen all the movies. Finally, the climactic scene seems oddly disjointed, with Harry in the cellar looking up at Malfoy Dumbledore and Snape. Don’t the moviemakers or the author want to show Harry as actively trying to stop the murder of his mentor? Harry seems awfully passive in this movie, almost cowering in the cellar. If he is the Chosen One, (and by the way who chose him), shouldn’t Harry be fighting for the forces of good? The forces of darkness are sure fighting him. He puts up a token fight later, but that hardly seems heroic. Harry Potter and the Half Blood Prince: Half Hearted. Harry Potter is back (Radcliffe) for year four at Hogwarts. There is a contest this year at Hogwarts, the tri wizard tournament, but it is closed to entrants below 17 and young Harry is only 14. The only way he can enter the contest is if someone throws his name into the Goblet of Fire. There’s already international representation in the tournament from Victor Krum (Stanislav Ianevski) Fleur Delacour (Clemence Poesy) and Howarts is already represented by Cedric Diggory. (Robert Patton) so imagine everyone’s surprise when Harry’s name comes flying out of the goblet. Immediately, Ron (Grint) is jealous of Harry and Hermione (Watson) is worried that something might happen to Harry. The first task Harry has is to fight a dragon, he is helped to figure out this task by Mad Eye Moody (Brendon Gleeson) and Hagrid (Robbie Coltraine) . If he survives, Harry then has to rescue his friends from the bottom of a lake, he is helped here by Moaning Myrtle (Shirley Henderson) Neville Longbottom (Matt Lewis) who gives him gillyweed to help Harry survive underwater Finally Harry makes his way through a maze to find the tri-wizard trophy. All along his quest Harry is plagued by nightmares where he sees Voldemort (Fiennes) Is Lord Voldemort making his way back to the land of the living to terrorize Hogwarts? I liked this movie, but the plot didn’t really kick in until the last half hour, which left a lot of time for teenage angst and junior high school dating trauma. I really didn’t care if Harry asked Cho Chang to the ball or not, I really didn’t care if Hermione and Ron Weasley hooked up. Ron Weasly has turned into a boorish jerk in these movies, and Grint is no Carey Grant in the looks or acting department. So Grint doesn’t have the skills to make his character subtle, so he comes off with the subtlety of a sledgehammer. Let’s be clear, these kids were chosen because they were cute as kids, that doesn’t mean they are good looking adults or good actors for that matter. Grint, Radcliffe and Watson confuse angst for anger at times, and the large parts of the tone of the movie takes on that of a soap opera. What’s more disconcerting is that the female characters are weak and weepy and serve only as decoration for the male characters. 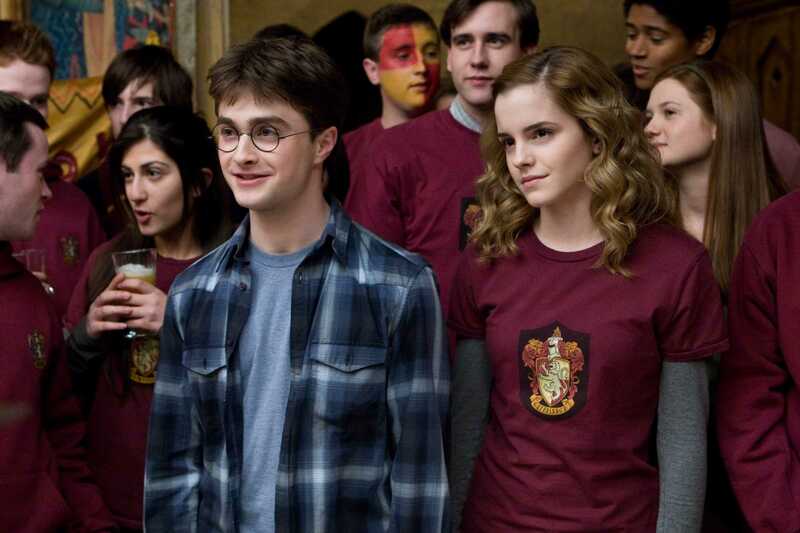 Why can’t Hermione be part of the tri wizard tournament? Fleur Delacour who is in the tri wizard tournament doesn’t even finish the lake mission, and is scared silly in the maze. Where is the character development for Cho and the Patil sisters? They are just treated like playthings for Hurry’s amusement. I would hope they are better written characters in the books, or else it reflects really badly on JK Rowling and her views on women. The cynical part of me says the adding of Asian characters in the later books were a way to market the books better overseas, I don’t know that for a fact, having never read the books, but I suspect it. Fortunately for the movie, the conflict between Voldemort and Harry builds nicely and is very engaging, including the battle between Harry and the revived Voldemort. That last half hour really saves this movie. Good acting by the adults, Fiennes, Gleeson, Coltraine, and Michael Gambon make this movie entertaining to watch. I think I was harsher on this movie the second time around because I have a much more critical eye about movies in general now than four or five years ago. Despite its interminable length, lack of character development and slow pacing, I still enjoyed the film. Harry Potter and the Goblet of Fire. Drink it in.